Shown tonight, Tuesday 30th June at 10pm on Channel 5. 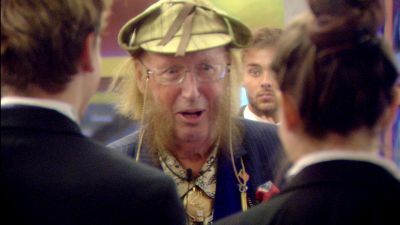 Tonight: John McCririck and Charley Uchea enter the house as guests for the Big Brother Hotel task. John tells Marc and Jack a few home truths. Marc’s involvement with Brian’s departure is debated. On tonight’s Big Brother’s Bit On The Side at 11pm on Channel 5, guests include: former Celebrity Big Brother Housemate, Anne Diamond, “I’m a Celebrity… Get Me Out of Here” contestant, Nicola McLean, former BB Housemate, Luke Marsden. PLUS John McCririck and Charley Uchea will be giving the lowdown on their Hotel Big Brother experience and Denise Robertson will be talking about unrequited love. · Danny and Aisleyne are talking about who they think will be evicted. Aisleyne says, “Maybe Jack. I don’t get why people don’t like him?” Danny says, “He was coming across as really moody.” They discuss Jack’s sensitive reaction to being nominated. Danny says, “I personally think he needs to win the show.” Danny tells Aisleyne about Jack’s reaction to Sam the day before which he thinks was over the top. · For this week’s shopping task the house has been transformed into Hotel Big Brother. The Housemates are split into guests and employees. Aisleyne must pick three Housemates to join her as VIP guests and chooses Danny, Chloe and Joel. To pass the tasks, employees must maintain high standards and cater to the guests’ every needs. · Jack is on concierge duty and must manage the other employees. Aisleyne requests prosecco on tap. Chloe requests a donner kebab and curry sauce. The guests are shown to the bedroom. Chloe exclaims, “Oh my god, I’m in Dubai. “ Marc plays a prank where Aisleyne and Danny are told they must sleep in the same bed. · Charley enters the house. Aisleyne is excited. Jack introduces her to employees. · Aisleyne falls off a chair and knocks over a table. Charley asks for her bag. Aisleyne says to Jack, “Get her ******g bag immediately. We don’t need an explanation of where it is we just need the bag.” Charley follows Jack into the bedroom and apologises for Aisleyne’s manner. Aisleyne comments, “He’s just doing it to annoy you.” Charley says that although Cristian is good looking, he doesn’t have a personality. · Hotel staff are waiting for another arrival. John McCririck’s arrival is announced. Jack is excited. Aisleyne runs to hug him. Chloe introduces herself and Jack introduces John to the staff. John announces, “I am sweating profusely and I want to get in that pool.” John tells Joel, Danny and Nick that they’ve being doing well on the series. · Charley catches Marc looking at her and asks why. He tells her, “You only fall in love once.” He tells Danny how attractive he finds her. · John is giving Marc some advice. John says, “You don’t need to swear because you’re so intelligent.” Charley says, “I think he’s entertaining to be honest.” John says, “You don’t need to do it. You are bright. You’re a nasty piece of work but you’re bright.” Marc says, “I’m trying hard.” Marc looks unimpressed. · Jack asks John about his popularity on the outside. John tells him it’s not good and says, “You weren’t the Jack you were to start with.” John encourages Jack to get back to that Jack. · Some of the staff are on a break in their quarters. Marc is talking about Brian saying, “Brian has ruined my time in here.” Cristian says that Helen and Marc antagonised him. Marc asks for examples. Marc gets annoyed as the other staff Housemates agree that Marc annoyed Brian but cannot give examples of specific behaviour. · Harry is in the Diary Room. “[The Housemates] are all using this phrase that Marc and Helen chased Brian over a wall… Brian left of his own accord.” Harry says she will not side with the others because she thinks it is wrong. · Marc tells Aisleyne about the conversation with John. Aisleyne says she tried to apologise to Marc. Marc says Aisleyne focussed on the Brian situation when she had not seen anything first hand. Marc asks her if she would stick up for a friend knowing they were wrong. Aisleyne is annoyed and says Marc stuck up for Helen when her behaviour was awful. The argument escalates. Danny calls her away.